Slow Cooker Apricot Chicken is so moist that it melts in your mouth. Throw 4 simple ingredients into the slow cooker and check on in at dinner time. It's so easy and a fail proof recipe. We are so excited to share this easy and delicious recipe with you. 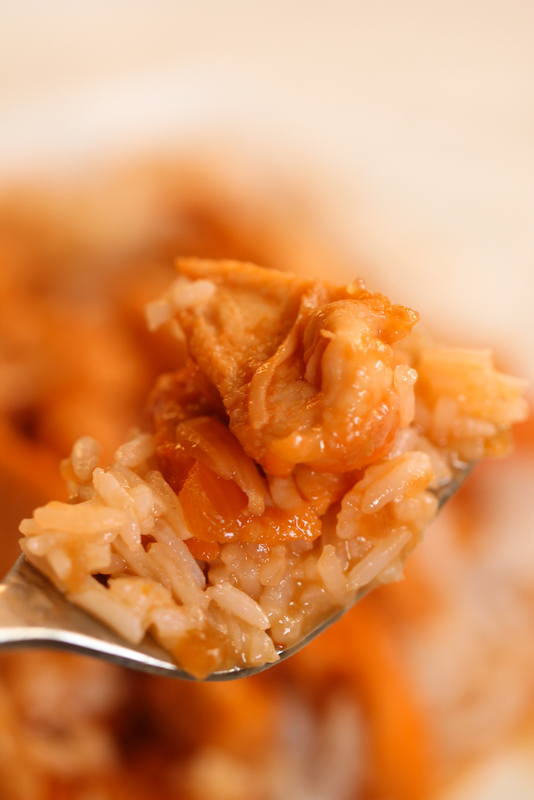 Our Slow Cooker Apricot Chicken is a great dish for dinner. And when it only takes 4 ingredients, you know it’s a WIN! 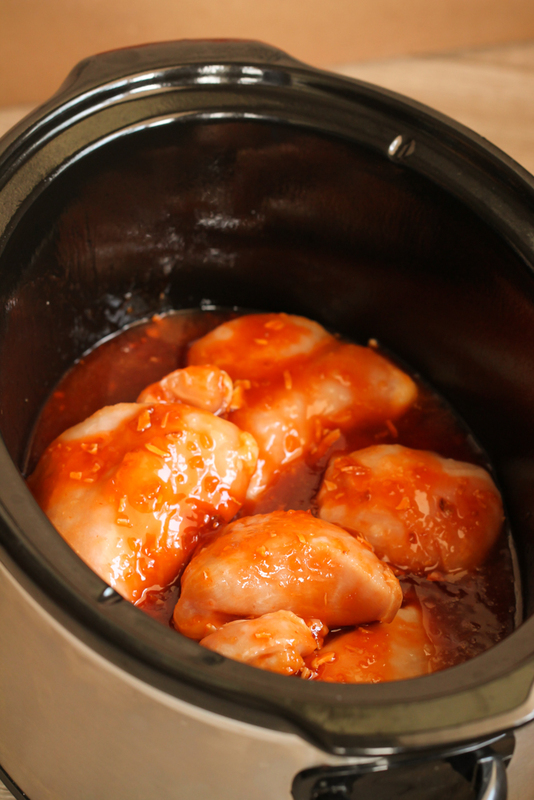 Slow cooker apricot chicken is very moist, and the apricot sauce is sweet and tangy. Our kids often request this chicken for dinner. It’s the perfect dish for a busy night. And you won’t believe how yummy it smells. Your whole house will smell amazing while slow cooker apricot chicken is cooking. You’ll definitely want to make this for dinner. do you need to brown your chicken first? You do not need to brown your chicken breasts before placing them in the slow cooker. We actually put them in frozen and they turn out moist and perfect every time. If you choose to brown your chicken first, season it a little with salt and pepper, or any other seasonings you prefer. Brown it in a very small amount of oil. It will add some flavor. can this apricot chicken recipe be baked in the oven? This chicken can be baked in the oven. You will want the boneless skinless chicken breasts to be completely thawed. Place them in a 9 x 13 inch baking dish. Then pour the apricot/dressing mixture over the top. Bake at 350 until cooked through and no longer pink in the middle. It will need to bake for 30-40 minutes. Turn chicken breasts over halfway through cooking time. To make slow cooker apricot chicken, you start with 4 simple ingredients. We love the simplicity of this recipe because you may already have the ingredients in your pantry or freezer. 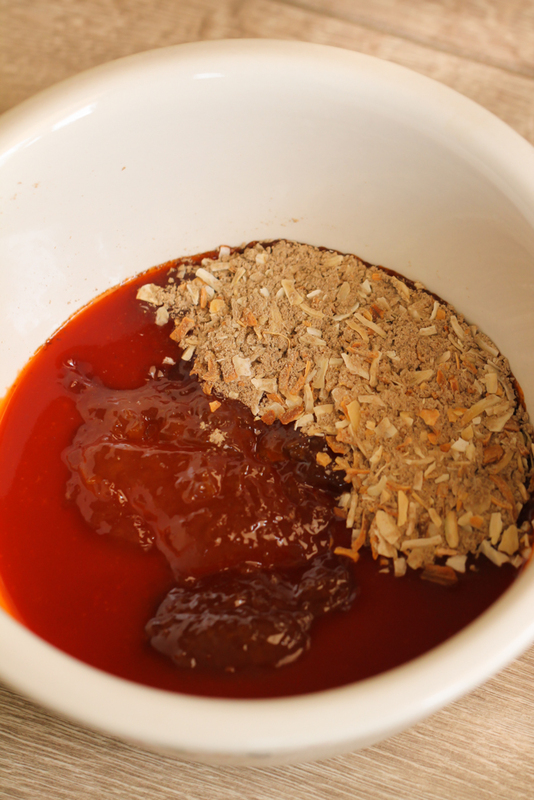 In a medium sized bowl mix together the apricot preserves, Russian dressing, and one package of dry onion soup mix. Stir those ingredients until well combined. We used a medium sized whisk to blend it well. Place the chicken in a slow cooker that has been sprayed with non stick cooking spray. Pour or spoon the apricot/dressing mixture over the chicken breasts. Place the lid on the slow cooker and cook for 4-5 hours on low setting. After the chicken is done cooking, shred the chicken and stir around in the sauce to be sure it’s all covered with the apricot sauce. 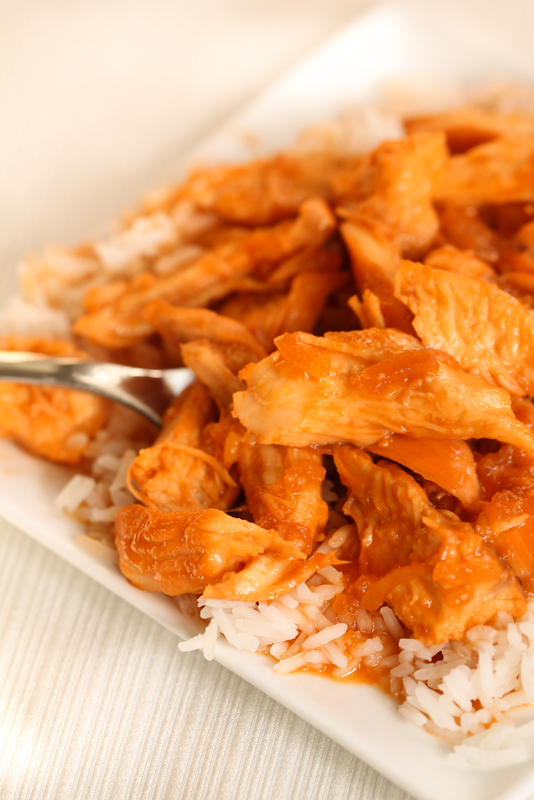 We like to serve the warm shredded apricot chicken over rice. It’s a hearty dinner that everyone will love. If you should have any slow cooker apricot chicken left over, it tastes amazing the next day for lunch. We like to store the chicken and the rice separately in air tight containers in the refrigerator. The chicken can be placed on a plate when ready to reheat, and microwave for about 30 seconds or until heated through. If you want to serve it over rice and have some leftover, just reheat the rice in the microwave also. Any of these amazing side dishes will go great with apricot chicken. Mixing bowl – This is a great set of bowls that come in 3 sizes. Whisk – We love the stainless steel whisk, and the mini one comes in handy. Slow Cooker – This is a great slow cooker that will take care of your cooking needs. In a medium sized bowl mix together the apricot preserves, Russian dressing, and dry onion soup mix packet. Place the chicken breasts in a slow cooker that has been sprayed with non stick cooking spray. Pour the apricot preserve mixture over the chicken. Cook on low for 4-5 hours, or until chicken is cooked through. Shred the chicken and stir until it's all covered in the apricot mixture. We like to serve this chicken over a warm bed of rice. Watch how to make our Slow Cooker Honey Sesame Chicken. Sounds delicious! Just pinned it to my recipe board. Have been making this in Micro for over 25 yrs. I always add bout 1/4 cup of mayo. Comes out delicious!! Can be done in oven also. Oh my goodness! 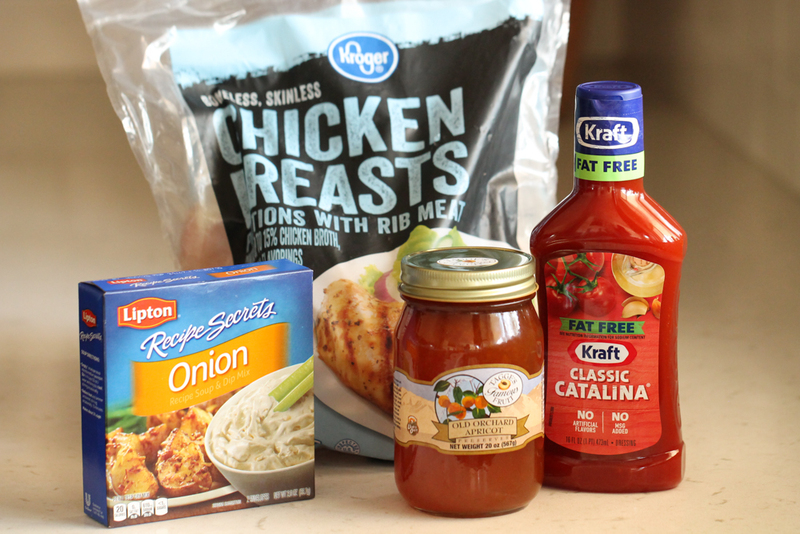 This is my husband's favorite chicken and it is SO easy to make and always tastes delicious! Thanks for posting the recipe! I usually end up calling my mother-in-law for it because I forget the quantities. 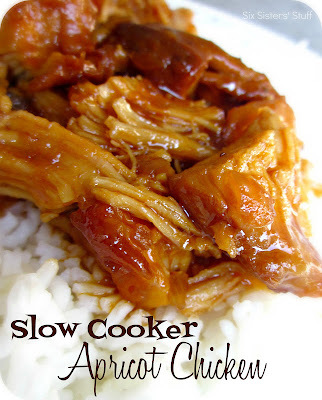 I love easy chicken recipes for the crockpot. We will try this for sure!!! Just mouthwatering...looks so easy to prepare & delicious! This is one of my favorite recipes! I serve it over brown rice, and it makes for super yummy left overs as well! Thanks for posting the recipe, as I always just "eyeball" it and it always turns out differently (and I like consistency). Made this for the second time last night. The first time I made it with Thousand Island dressing because I couldn't find Russian. The second time I found Russian dressing but I accidentally bought Apricot Pineapple preserves and it was still great. This recipe seems fool proof. Love it! Has anyone tried cooking it on low for 8 hours instead of the high for one, low for 4? I usually turn my crockpot on at 7 am and it switches over to keep warm at 3 pm. The recipe sounds good, but I might have to save it for a weekend, if it can't be left on low all day. I think it would work fine to cook it on low for that long where your crock pot switches to warm. Let us know how it goes! oh my goodness. I made this today. I put frozen chicken breasts in the crockpot before I left for church. I started it around 9 on low and it cooked until we got home, around 2:30. It was amazing!! I will be making it again. Thank you!!! I hate Russian dressing. Does anyone have a suggestion of something else I could use? I've used Dijon mustard instead of the russian dressing and it was delicious. I would use 1 cup of preserves and 1/3 cup of mustard with the packet of onion soup mix. I make a similar recipe that uses one cup mayo (not miracle whip) and 3 Tbsp of ketchup with the soup mix. Turns out great! We have an apricot tree in our yard. 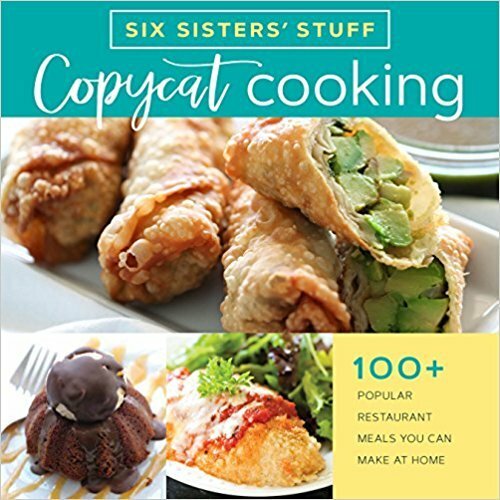 so I am always looking for recipes to use them up! My crockpot is MIA... :( any thoughts as to how to prepare this and get similar results but using tge oven or stove? I make a very similar recipe mixing the sauce and baking at 350 covered for 30 min, then uncovered for 30 min. Always turns out! Do you have any suggestions on making this with something other than the onion soup mix?? I have this question too. Or, does anyone know of a gluten-free onion soup mix? Thanks. This was delicious! I ate the leftover chicken on hamburger buns, and it made for a delicious chicken sandwich. Thanks so much! I often make this recipe substituting Peach preserves for the Apricot. It's always a hit in my house! I want to try chicken drums with this instead of breast...what do you ladies think? My mom made this recipe a lot when my sisters and I were growing up. I remember it always being delicious! I have since become a vegetarian, but I plan on trying this on some tofu, because I have been craving it lately! Do you think I could combine the other ingredients and throw them in a bag with the chicken for a freezer meal? I know it is easy as it is, but it is for someone else who really can't think about cooking right now so I'm trying to make it as easy as possible. Made this tonight. So easy and yummy. The kids kept asking when we were going to eat after smelling it all afternoon. This recipe is a keeper, will def. make again. Thanks for all your great recipes. My mom made this my entire childhood,except she called it Russian Chicken, and made it with whole chicken pieces in the oven, slowed baked in a Pyrex. Its always been one of my (and my whole families) favorites!! I think I will try it in the crock now. I add a can of crushed pineapple! Delicious! Does the meat have to be thawed or frozen? We have done it both ways. Frozen is a lot quicker! My husband is a diabetic. Do you think it would turn out good with sugar free apricot preserves?? Yes it will work great. You just want the yummy apricot flavor and it should still give you that with sugar free preserves. I make my own. I'd leave the pickles out for this chicken recipe. 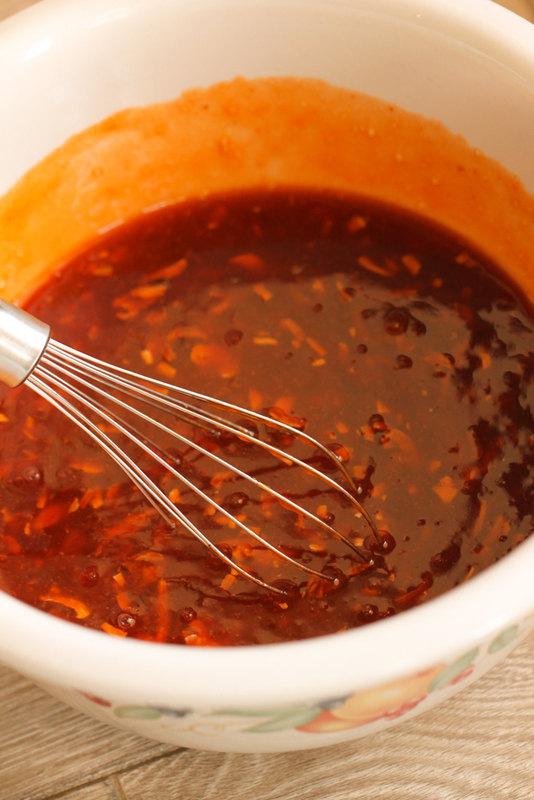 Russian Dressing 1/2 cup mayonnaise 2 tablespoons ketchup 2 tablespoons pickle relish 2 tablespoons fresh lemon juice 1 teaspoon Worcestershire sauce 1/2 teaspoon coarse salt 1/4 teaspoon freshly ground pepper Combine all of the ingredients in a small bowl. Dressing can be covered and refrigerated for up to 1 week. What about with Simply Fruit Apricots instead of Preserves? What is best if I cannot find Russian dressing? We have never used Simply Fruit Apricots, but if it is close to the consistency of Apricot preserves, it should work just fine. You could use french or thousand island dressing in place Russian, but the taste will be different. I have made the chicken with the cranberries in the past many times. I found this recipe and the family said they love this one the most. Just made this for the family last night and they loved it! I cannot wait to try this! I like to double, and even triple meals that I make and freeze the "extra" meals to give away to family or friends in need of a meal, or have another meal for my husband and myself in another week or two and this will be perfect for that! I think the chicken would also be great sliced and put in a lettuce salad or in a wrap. HI! I have made this recipe many times and it has become a regular crock pot meal.So good, and easy... I have used this sauce recipe with a bag of frozen turkey meatballs and this is so delicious we have named this recipe AMAZEBALLS. Because the frozen turkey meatballs do not give off the liquid as chicken would, the sauce has a thicker consistency which is absolutely wonderful! Thanks for the great inspiration! This has been my birthday meal for many many years! Absolutely delicious. You can use the same recipe and put in the oven at 350 for a hour. 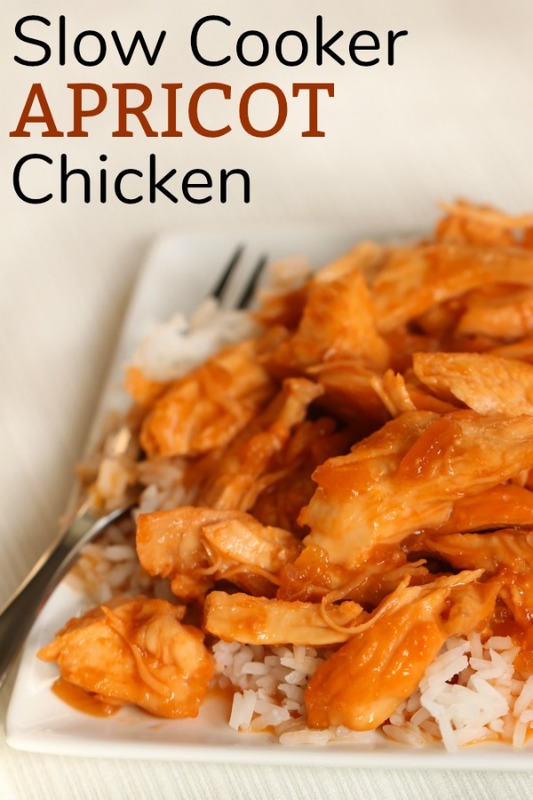 Boneless chicken breasts work great for the slow cooker apricot chicken! Yes, Skinless boneless chicken breasts! Just made this tonight!!! So delicious! Even my picky 2 year old ate some. We served over mashed potatoes. Thanks! Thank you Grace!!! So glad the family liked it. It can be tricky getting 2 year olds to try something new for dinner! Have a great week! Wow! This was amazing. Thanks so much!!! This sounds amazing! ! What can I use instead of onion soup mix? You can make your own onion soup mix if you don't have any. Here are the ingredients you will need: For every ¼ cup of onion soup mix in a recipe, you can combine 3 tablespoons of minced onion flakes, 2 tablespoons of beef bouillon powder, ½ teaspoon onion powder, ¼ teaspoon parsley flakes, 1/8 teaspoon ground celery seeds, and a pinch each of black pepper, sweet paprika, and salt. Could you tell me the weight amount of the meat or chicken. Probably close to 3 pounds. It just depends on the size of your chicken breasts. On the average, a chicken breast can weigh anywhere from 6 to 8 ounces. Hope this helps.